Clematis cirrhosa Jingle Bells, flowers all through christmas starting in december then finishing in march, with nice sized evergreen foliage the rest of the year, Jingle bells can reach heights of around 12 feet and can also be grown in a pot if you so wished. 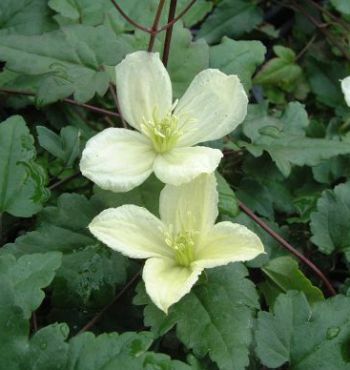 All the Cirrhosa family of Clematis prefer to be grown in a sunny spot that does not get too much of the prevailing wind, so we would reccomend that you plant Jingle Bells in a south or west facing position that is reasonably sheltered. No essential pruning is required to the clematis jingle bells either so it can be planted at the very back of a bed where you don't ever need to get to it. Some say that you can get a slight citrus scent from the mature flowers. Clematis Shoppers online: 315 .